Discovery Funeral Plan - Compare Funeral Plans in South Africa. Here we will be discussing the benefits of the Discovery funeral plan. They offer a great cash funeral plan. You do not need to have any other Discovery products to qualify for their funeral policy. OK, so let’s look at the provider first. This will give you some idea of who they are and what they do. Discovery is no stranger. They offer a wide range of insurance products. Most people know them for medical aid and life insurance. However, they have recently been expanding into short term and other insurance. We appreciate them for a couple of things. Firstly, the promote wellness. They reward their clients for being healthy. Discovery has been around for more than two decades. We find it very impressive that they can compete with the best for such a young company. We are not saying they are not established. But in comparison with some of the providers we represent, they are relatively new. If you are looking for a no mess, straight forward policy, this is it. Discovery offers clients a cash policy with some original benefits. They strive to pay claims within 24 hours. This is the fastest of any of the providers we represent. They understand the importance of having money quickly. They also offer up to R60 000. This is the most of any of the providers we represent. The minimum amount of cover you can get is R10 000. You can cover your direct and indirect family members on the same policy. Cover starts from R48 p/m. 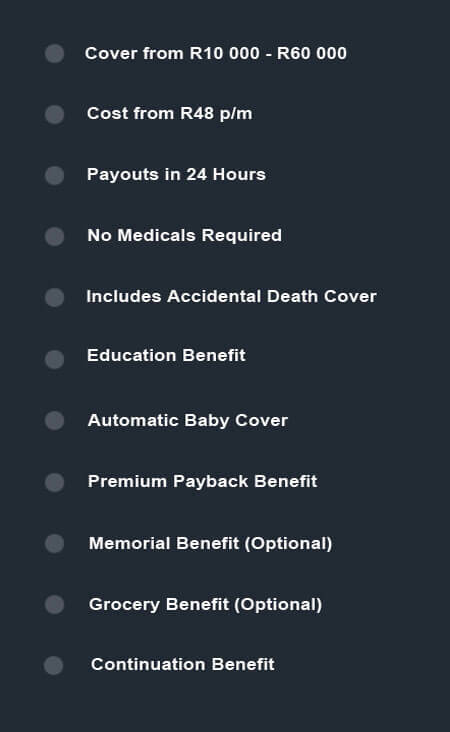 The Discovery funeral plan comes with optional and automatic benefits. The policy automatically includes accidental death cover. If there is a claim because of an accident, the cover will double. This benefit will be available to both the policy holder and spouse. Some of the other benefits are baby cover, groceries cover, education benefit and even unveiling cover. You can tailor make your policy. You can choose what optional benefits you want to add to the burial plan. The Discovery plan will pay the beneficiary cash. You have to pay many things when you arrange a funeral. Some examples include a coffin, fresh flowers, pamphlets, catering etc. With a cash plan, you can shop around for the best deals. All the money that’s left over will belong to the family. It’s important to trust your provider. With Discovery, you know you are in great hands. You do not need to have other Discovery products to qualify for their funeral plan. It’s a cash only plan without pointless benefits. They offer the highest cover amount we represent. Discovery is an amazing product with valuable benefits. Let’s get you the cover you and your family deserve. Our teams of friendly consultants are just waiting for you to complete a contact form. As soon as we get your details, one of our consultants will be in touch. You will speak to the same consultant from start to finish. We do not give your details to all the providers we represent. Your details will remain with us. We want to make the process as quickly and hassle free as possible. Let us take care of your funeral plan needs today.